The current standard hardware platform of SciEngines is the RIVYERA architecture. As a successor to the legacy COPACOBANA series, the RIVYERA’s different models provide increased logic-cell count, memory, bandwidth and its cutting edge Application Programming Interface. While still providing immense energy- and space-efficiency, most systems can also be clustered to further enhance performance to data-center levels. Legacy products are products that have reached end-of-sale and end-of-life. The last day to order the affected product(s) is August 1, 2017. Existing customers with active service contracts will continue to receive support for ‘Legacy’ products by the SciEngines Technical Assistance (TAC) or their personal Key-Account Manager. In order to receive further information please contact your personal Key-Account Manager. COPACOBANA, the Cost-Optimized Parallel Code Breaker, was the first standardized FPGA-based high-performance computer, which was optimized for running cryptanalytical algorithms. With 120 FPGAs of the type Spartan-3 1000, COPACOBANA was originally designed for DES cracking. COPACOBANA V4-SX35 was an FPGA-based machine optimized for running cryptanalytic algorithms that can take advantage of a high amount of DSPs and the possibility to execute a multiply-add or accumulate function every clock at high frequencies. 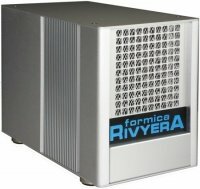 The new RIVYERA computing-architecture is the technological successor of the COPACOBANA with significantly increased computation resources. This model provides a backplane with up to 16 cards and a total of 128 high performance FPGAs of the type Spartan-3 5000 within a 3 high unit, 19-inch server chassis. Using up to four Virtex-7 2000T FPGAs in its standard configuration, the RIVYERA V7-2000T was less cost-performance optimized for parallel computing. Instead it provided very large chips for extraordinary designs that would simply not fit into any other FPGA – e.g. in ASIC design projects. Using up to 32 Spartan–6 LX150(T) FPGAs in its standard configuration, the formica provides high-density supercomputing power to a wide audience. With its miniaturized design, simply attach your new FPGA accelerator to your regular workstation or laptop to have a supercomputer directly in your office.